‘In Living Color’ Making a Comeback on FOX! Remember In Living Color, well it’s back for a two part special! That should be fun! It will be a new cast, but I wonder who will make could make an appearance…Â JenniferÂ Lopez, Jim Carrey or Jamie Foxx…is it a given that some Wayan may make an appearance! Two snaps up! An updated version of the groundbreaking FOX sketch comedy series â€œIn Living Color,â€ will air as two half-hour specials in the spring of 2012.Â Exact dates to be announced. The specials will be hosted and executive-produced by original series creator/executive producer Keenen Ivory Wayans.Â This is a modern-day take on the hit sketch comedy show that will feature a new cast of fresh, young talent, as well as musical performances by special guests. â€œIn Living Colorâ€ aired from 1990 to 1994 on FOX. Starring Keenen Ivory Wayans and Damon Wayans, the show launched both of their careers, as well as those of siblings Shawn, Marlon and Kim, not to mention featured players Jim Carrey, Jamie Foxx, David Alan Grier, and â€œFly Girlâ€ Jennifer Lopez. 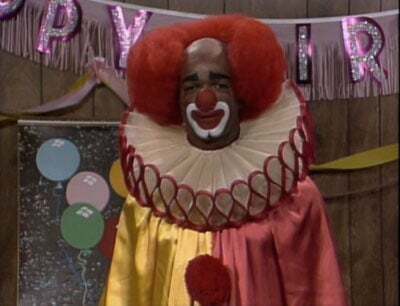 The iconic series put a hip, edgy spin on popular culture and featured characters and sketches that became part of the American vernacular, such as “Men on Film,” starring flamboyant film critics Blaine Edwards (Damon Wayans) and Antoine Merriweather (David Alan Grier); Homey D. Clown (Damon Wayans), a dour urban kiddie entertainer whose catchphrase was “Homey don’t play that!”; streetwise scam artists “The Home Boys” (Keenen Ivory and Damon Wayans); and Fire Marshall Bill (Jim Carrey), a disfigured safety expert. Jesse James Still Dissing Sandra Bullock! Steve Carell Gets Interviewed “Between Two Ferns”! Did Jacqueline Laurita Quit ‘Real Housewives’?